A few tempting items today but I’m behaving. 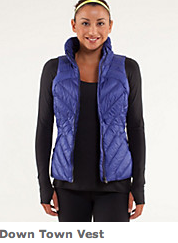 The Down Town Vest was initially calling my name but for $168 I’d love it to be reversible and to have zippered pockets. Seems kind of basic compared to puffy vests from years past. My Daze Peace of Mind Vest was two colors, reversible, had pockets on both inside and outside and the outer pockets where zippered DWR and also at least $10 cheaper. Also, the inside had a different quilt pattern then the outside. Good. I’m talking myself off the ledge on this one. Also, how happy am I that the Angel Blue Define Jacket wasn’t uploaded and I didn’t have to struggle with that one? super happy about that. Did you guys order anything tonight? Verrry tempted by this No Limit Tank. 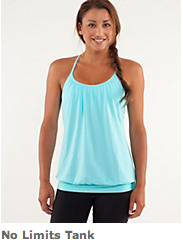 But we’ve seen the NLT in every single color run lately so It’s almost like Cool Racerbacks only way pricier.